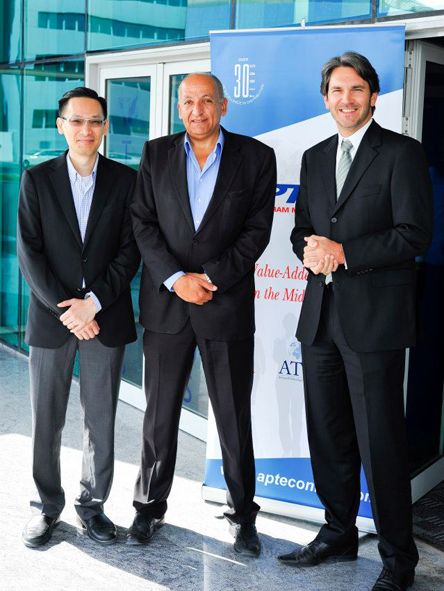 Aptec, an Ingram Micro company, expands its training facilities in Dubai. Dubai, UAE, 18th February 2013 – Aptec, an Ingram Micro Company, opened yesterday its new training center facilities in Dubai during the official inauguration ceremony which was attended by Aptec vendors, reseller partners and other guests from IT channel network. New facilities include 2 training rooms with total capacity of 30+ students and are all outfitted with latest training equipment to provide classroom, instructor-led trainings, to reseller partners in the region. Extended training facilities will help Aptec to increase the number of courses and total number of students trained in a year starting 2013. Today Aptec runs instructor-led courses, as VATC (VMware Authorized Training Center), and on-line courses, as authorized Cisco Entrepreneur Institute’s training partner, through ATS (Advanced Technology Services), a professional services subsidiary within Aptec – an Ingram Micro company. Aptec was signed as the VATC in the Middle East in October 2011 and since then was successfully providing trainings to partners in the region. Aptec started by providing VMware vSphere (Install, Configure and Manage) training course in 2011, and during 2012 added more VMware courses: VMware vSphere (Fast Track ,Design Workshop, Optimize and Scale), also VMware View (Fast Track), VMware View (Install, Configure, Manage) and very recently new courses VMware vCenter: Site Recovery Manager (Install, Configure, Manage) and VMware vCloud: Deploy and Manage the VMware Cloud. Nermin Zayed, Business Development Manager for Educational and Professional services in ATS, added: “Year 2012 showed huge demand from the channel for VMware training courses. We were faced with the situation that we had to run very intensive training calendar because of non-availability of training rooms. Today, we are happy to receive new facilities which can accommodate interested partners who are eager to go through the courses and get certified. Resellers can find ATS’s updated training calendar at the company’s website www.atservice.biz”. In 2012 Aptec was covering UAE and other GCC countries (Oman, Kuwait, Qatar) with its training courses for VMware, and is planning to expand in 2013 to KSA and Egypt. With the extended territory of Middle East, Turkey and Africa, Aptec- an Ingram Micro company, covers now more than 75 countries in the region. Aptec will be expanding its educational and trainings offerings to these countries within next 2 years. Aptec – an Ingram Micro Company (www.apteconline.com) is the Middle East, Africa, Near East and Turkey’s largest technology Value-Added distributor and a leading technology sales, marketing and logistics company. Established in 1980, Aptec is the oldest distributor in the region. As a vital link in the technology value chain, Aptec creates sales and profitability opportunities for vendors and resellers through unique marketing programs, outsourced logistics services, technical support, financial services and product aggregation and distribution. The company provides a wide range of solutions and services to more than 10,000 resellers and offers thousands of products from leading ICT manufacturers. From its offices and warehouses in 5 countries and with more than 340 specialized staff, Aptec serves over 70 countries in the region.